Guess What’s in The Picture? In 2004, as a result of mad cow disease (Bovine Spongiform Encephalopathy), the USDA’s Food Safety and Inspection Service (FSIS) ruled that beef could no longer be processed this way, because testing showed that parts of the bovine central nervous system ended up in the meat. 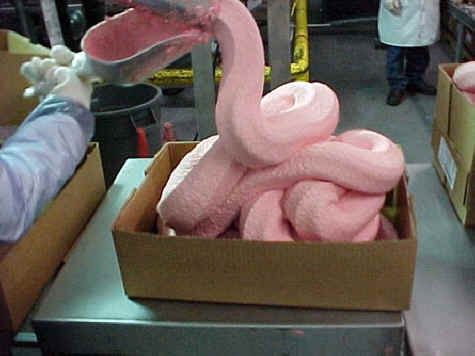 As for products using mechanically separated chicken and pork, FSIS ruled that they are safe to eat, but required them to be labeled as such. Despite them being safe, FSIS states that no more than 20% of the meat in a hot dog come from mechanically separated pork. Buying something prepared in a factory, such as chicken nuggets, or hot dogs, you’ll always get the worst meat, and it will always be combined with additives and other sources of fat.